Fearlessness doesn’t mean disregarding consequences, it just means assessing risk and acting accordingly. The way I see it, there are two kinds of fear: The kind you see clearly, and the kind you don’t. The former is simple. In my case, it’s my galeophobia (fear of sharks). No one will ever convince me that swimming in the ocean is safe. I’ve seen the statistics. I don’t care. Even if I’m swimming in a lake, I’m afraid of being eaten. It’s just the way it is. 15-20% of people harbor a similarly irrational phobia. Such fears are identifiable, and therefore easier to circumvent, even if you cope by never getting on an airplane (aviophobics) or avoiding a elevator at all costs (clausterphobics). Such fears are also easier to overcome: Get on the airplane or get in the elevator. But then there’s the second kind of fear, the kind you don’t know the cause of; That’s the tricky one. That’s the feeling I get when I try to talk to the pretty girl ahead of me at Starbucks. It’s in the pit of my stomach, not dissimilar to the way I feel when I look at the ocean and picture rows of gnashing teeth. But what exactly am I picturing now? Am I simply afraid of rejection? Maybe, but I know not to take it personally. Am I afraid she’ll be offended by my advance? A little, but I know how to read social cues and be respectful. So what exactly am I so worried about? Well, I don’t really know. I get the same fear before an audition, or before I ask some guys at the Y if I can join their basketball game. Heck, I even felt a fear like that before starting this piece. 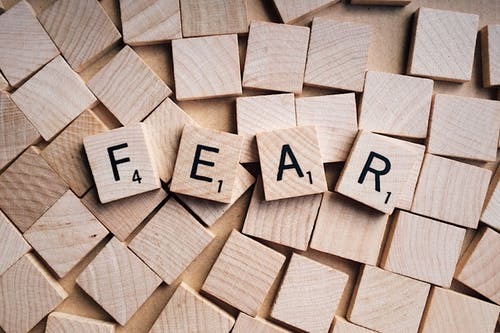 When such mystery fears get really bad, they’re called anxiety, which is reported by 18% of adults (and 41% of employees in the workplace). But it doesn’t have to be full blown anxiety to merit an investigation. Me: What’s the worst that can happen? My Brain: The shark could decide to bite my leg and drag me down to an extremely painful and messy death. That seems pretty bad, so I decide not to go in the water–again, I don’t CARE what the statistics say on this one–but in the case of the girl at starbucks, what’s the answer? Realistically, I mumble a really lame “hello”, she ignores it, and everyone moves on with life. Not really as bad as being eaten by a shark. Let’s look at it in the context of an audition. What’s the worst that can happen? I don’t say the words on the page in a way that the people casting it think fits the character, I don’t get the part and, again, everyone moves on with life. It works the other way around as well. If I’m getting that feeling because, say, someone I don’t fully trust is offering me a drug I’m not familiar with, then the worst thing that can happen is much more severe. Chances are I’ll politely refuse. That’s the thing about fearlessness. It doesn’t mean doing anything with no regard for consequence, it just means assessing risk and acting accordingly. If you can do that, then there is literally nothing to be afraid of. You’re always sure you’re making the best decision possible. At a time when 40 million Americans suffer from anxiety, it’s important to narrow down the reasons to be afraid. Next time you feel that knot in your stomach, take a moment to consider the worst thing that could happen. If the risk is worth it, take it. If it isn’t, don’t. Either way, chances are you’ll get rid of a fear that’s holding you back, and give yourself more time to worry about the things that really do demand your attention. Or… You know… Donald Trump. Edward Hoke is an actor and writer, based in Los Angeles. This summer, he completed his BA in Theater and Classics at Northwestern University after three years of study. He is an avid Red Sox fan.